How to update a document – NOT! Canadian International Co-operation Minister Bev Oda needs to work on her document management skills. 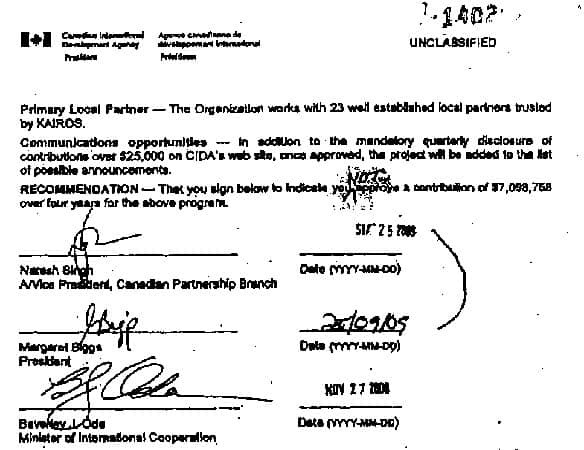 She hand wrote the word ‘NOT’ in an official document, completing changing its meaning so that federal funding would be denied to an organization. In doing so, and in trying to cover it up later, she signed her political own death warrant. All information developers need to be mindful of changes. Whether using the track changes feature in Word, or some other system, ideally we should record all the changes made to a document. This is especially true if your documentation is going to be translated. Tracking changes and using version control also allows you to revert to earlier versions if needed. Too bad Ms. Oda wasn’t using such a system. It might have saved her much grief.